Driving Award Discounts Apply ! 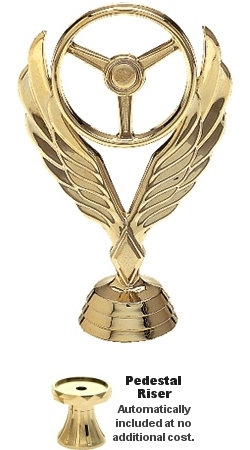 Driving Award trophy makes a great gag gift for the Worst Driver, Most Speeding or Parking Tickets or other funny driving awards. Made of spun nylon with a gold finish, the figure stands 3-3/4" tall. Placed atop matching gold pedestal riser for additional 1-7/8" of height. Price includes figure, pedestal riser, base and free personalization on a laser engraved plate, or for an additional $5.00, select an engraved brass plate.